The ECR state-of-the-art Training and Education Center is located at our corporate headquarters in Utica, NY. The Center offers a wide range of programs that explain and demonstrate HVAC principals as well as product installation, maintenance, and operation. Hands-on exercises with live-fired-equipment as well as informative video presentations are just a few of the features on hand. ECR�s new training center was designed and built to meet the needs of our wholesalers and installers. Call us to schedule a visit and we�ll put together a session that addresses your interests and questions. 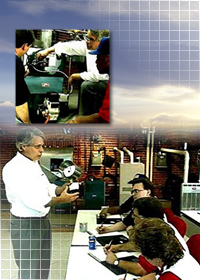 ECR training programs cover a wide range of topics including Hydronic Systems, Gas Venting and Ventilation, Heat Loss and Sizing, Selling Techniques and more. These "Road Show" seminars are conducted in cooperation with ECR Distributors. Trainers will be in various locations throughout the country throughout the year. Contact your ECR Distributor for "Road Show" classes in your area.